Moe Neal breaks free for a run against Wake Forest. Mandatory Photo Credit: Kicia Sears, The Juice Online. As we countdown to kickoff in August, we’re going to be doing a team-by-team preview each week over the summer. SU will open its 2018 regular season when it plays Western Michigan on Aug. 31. FAMILIAR FACE: Syracuse fans will see a familiar face patrolling the sidelines when the Orange opens its 2018 season. Tim Lester, SU’s quarterbacks coach and offensive coordinator under Scott Shafer, is now head coach at Western Michigan. In 2016, the Broncos, under PJ Fleck, posted a 13-1 regular season record and gave Wisconsin all it could handle in a 24-16 loss in the Cotton Bowl. Expectations were high for Lester after he returned to his alma mater when Fleck took the job at Minnesota. A rash of injuries, including to star quarterback Jon Wassink at the end of the season, tempered those expectations, as Lester and company finished 6-6 and missed out on a bowl game. But with 12 starters returning in 2018, there’s hope again in Kalamazoo. WHO TO WATCH FOR: Without Wassink, the Broncos lost three of their last four. He still finished with an impressive freshman campaign, completing 124 of his 193 passes for 1391 yards and 14 touchdowns to just four interceptions. He’ll return for his sophomore season fully healed from the broken collarbone. One of Wassink’s favorite targets was junior D’Wayne Eskridge, who finished with 30 receptions for 506 yards and three touchdowns. Senior center John Keenoy was named first-team All-Mid-American-Conference by Athlon, though the Broncos are without standout Chukwuma Okorafor, now with the Pittsburgh Steelers. On defense, a unit that allowed just 29 points per game last season will need to make up for the losses of linebackers Robert Spillane and Asantay Brown. PREDICTION: Western Michigan could’ve easily ended up with a plus .500 record last season, losing three games by seven points or less, while keeping pace with USC (49-31 loss) and Michigan State (28-14). There’s enough talent to walk into the Carrier Dome and pull off an upset. 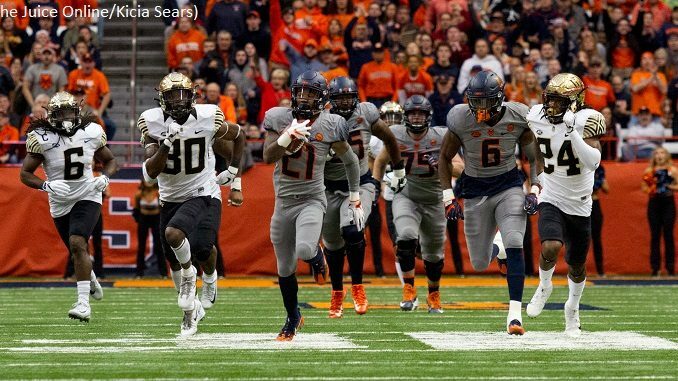 SYRACUSE 31, WESTERN MICHIGAN 24.